As September comes to a close this week, I decided to look back and see how the pace of fall migration proceeded throughout the month here at my home in Hampton, Tennessee. On the first day of September, which doubled as Labor Day this year, I saw a single Common Nighthawk, as opposed to the flock of 50 nighthawks I observed on the final day of August. I only saw one warbler, but it was a Chestnut-sided Warbler and different than the three species — Yellow-throated Warbler, Northern Parula and Magnolia Warbler — I saw on the final day of August. Photo by Bryan Stevens A Yellow-throated Warbler makes a migratory stop in my yard on the first day of September. Other birds that helped me welcome September included several Gray Catbirds and Blue-gray Gnatcatchers, Eastern Wood-Pewee, Brown Thrasher and family flocks of American Goldfinches and House Finches. Earlier in the day, I also watched and listened as a Common Raven flew overhead. The Ruby-throated Hummingbirds are also still numerous. I tried to carve out some time each day in September to look for migrants visiting my yard, but the weather and my work schedule didn’t always make that possible. Nevertheless, I spent a good amount of time scanning for migrants at every opportunity this past month. I call my “migrant watching” my “lawn chair birding” because some of the time I am seated in a plastic lawn chair scanning trees and shrubs for any sign of movement. I spent a lot of time on my feet, however, since a flash of color or an unknown chip note sends me searching. My mother joins me much of the time, and she has a welcome ability to detect movement among the green leaves of the trees. 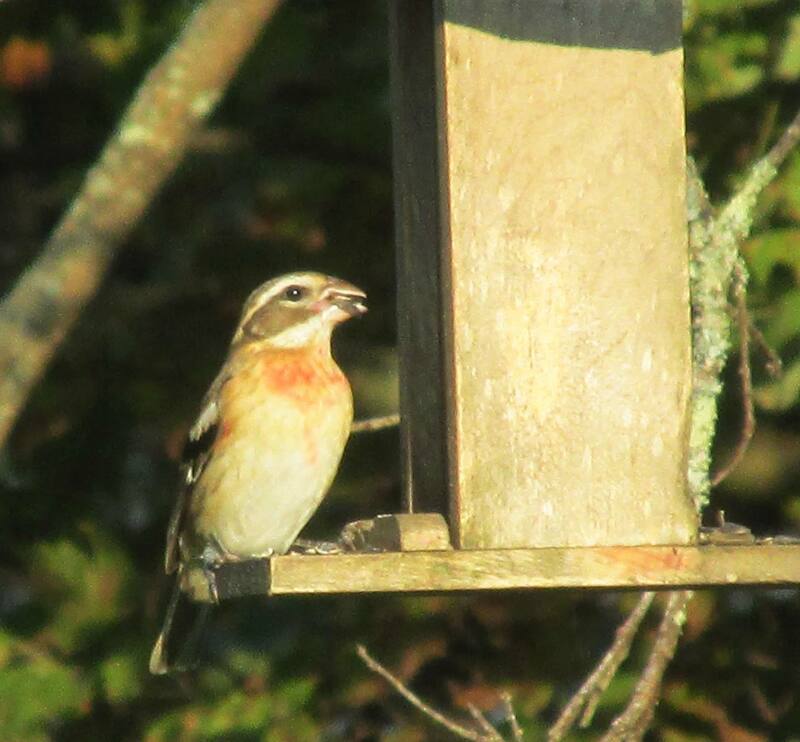 Some of the Rose-breasted Grosbeaks migrating through this fall still retain some of their rosy color. One particular spot in the yard seems better than others for detecting migrating visitors. Some hawthorn and willow trees, as well as an American holly and wild cherry trees, line the creek that flows past the yard. On the other side, the fish pond borders these trees. The branches of dead conifers offer attractive perches for such birds as Eastern Wood-Pewees and Cedar Waxwings, as well as the occasional warbler. On Sept. 5, I enjoyed another good evening of lawn chair birding, adding a few new warblers for the fall to my list. I saw four species, but two of them — immature Black-and-White Warbler and Black-throated Green Warbler — were new for the fall. I also saw Chestnut-sided Warbler and Northern Parula. A sizable flock of at least 50 Common Nighthawks passed overhead at one point in the evening. Other sightings included Eastern Phoebe, Brown Thrasher, Gray Catbirds, Wood Thrush, Pileated Woodpecker, Red-eyed Vireo and Ruby-throated Hummingbirds. All the resident feeder birds have enjoyed a good nesting seasons. The numbers of Song Sparrows in the yard are showing a definite increase. Three Mallards, which often spend the winter on the creek and fish pond, also made their return on Sept. 5 after an absence of a couple of months. Photo by Bryan Stevens A young American Redstart perches on high to hawk for insects. On Sept. 6, I saw a Cape May Warbler (young male) feeding low in vegetation in the swampy area near the old rock springhouse in the backyard. It might seem odd to find a Cape May feeding so low to the ground, but it was at the base of the large Norway Spruce growing in my shady backyard. This is a new warbler for the fall migration season. The day also brought sightings of Magnolia Warblers and a Northern Parula. An Eastern Phoebe spent a lot of time snapping up flying insects. A few Common Nighthawk returned, and were joined in their soaring overhead by Chimney Swifts. Sept. 8 was a little slow as far as migration goes, but I did manage to glimpse an American Redstart and a Cape May Warbler, as well as a Blue-gray Gnatcatcher. 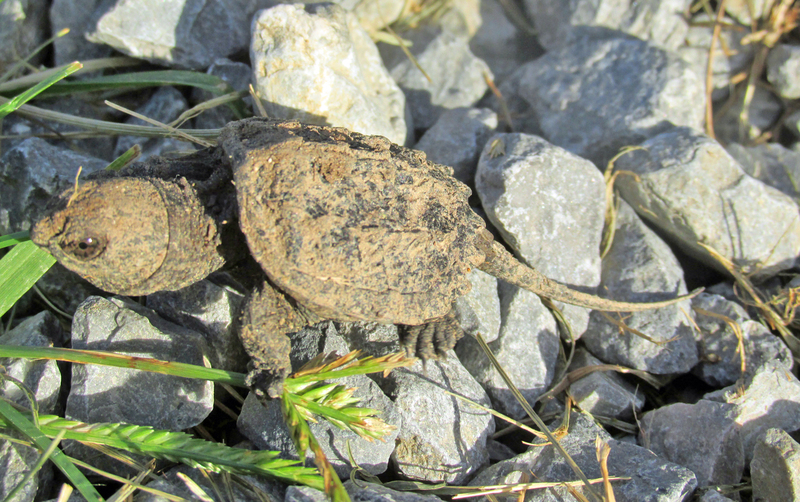 The biggest excitement of the evening came with the discovery of a hatchling Snapping Turtle that had dug its way out of the nest that the mother turtle dug back in June. Before a deluge of rain arrived on Sept. 11, my mom and I did some lawn chair birding and found six warblers — Wilson’s, Tennessee, Magnolia, Cape May, Chestnut-sided and Hooded — as well as a female Rose-breasted Grosbeak, a flock of five Chimney Swifts, Gray Catbirds, Brown Thrasher, Ruby-throated Hummingbirds and all our feeder birds. A Scarlet Tanager feeds on wild cherries. The Wilson’s Warbler, a male, was only the third of its kind that I have seen here at home. This was also the second male; a female Wilson’s also visited one fall. I didn’t have a lot of time for lawn chair birding on Sept. 12, but I did enjoy observations of Gray Catbirds, Chimney Swift, Ruby-throated Hummingbirds and a Brown Thrasher. In addition, I encountered a large flock of Common Nighthawks over Bell Cemetery in Limestone Cove, Unicoi County. I also encountered a “swarm” of dragonflies over the now-closed swimming pool at Erwin Fishery Park. The swarm didn’t consist of just dozens or hundreds of these insects. There must have been thousands of dragonflies. I think the majority of them were Green Darners. They were harvesting some sort of flying gnats. At the same time, Chimney Swifts were plunging through the swarm, but I think the swifts were after the same gnats as the dragonflies. A flock of Cedar Waxwings also got joined the scene for awhile. The rain brought out the warblers and other migrants on Sept. 13. I observed two Cape May Warblers, a Chestnut-sided Warbler, male Black-throated Blue Warbler, male Hooded Warbler, Tennessee Warbler and an American Redstart. I also watched Cedar Waxwings, Brown Thrashers, Gray Catbirds, Ruby-throated Hummingbirds, Blue-gray Gnatcatchers, Downy Woodpecker, Pileated Woodpecker, American Goldfinches, House Finches, Song Sparrows, Eastern Towhees, Carolina Wren, Carolina Chickadees, Tufted Titmice, White-breasted Nuthatches and probably a few other birds. I guess that it’s true that foul weather brings out the birds. This makes sense. Under conditions such as bad weather, the birds probably have to work harder to find enough food. On Sept. 14 — an overcast Sunday — I had time to do a little lawn chair birding before leaving for work. A new warbler for the fall list, a female Common Yellowthroat, put in an appearance, joined by a Cape May Warbler and two American Redstarts. A Belted Kingfisher also stopped by the fish pond. I had time to do two sessions of lawn chair birding on Sept. 15. The afternoon session of lawn-chair birding with my mom really paid off. New for the fall was a Swainson’s Thrush. Warblers included three American Redstarts (including an adult male), as well as Tennessee Warbler, Magnolia Warbler and Chestnut-sided Warbler. We also observed were Indigo Buntings, Brown Thrashers, Gray Catbirds, Rose-breasted Grosbeaks, Cedar Waxwings and an Eastern Phoebe. I hope to go back out for another session before dark. The evening session of lawn-chair birding on Sept. 15 delivered some results, too. 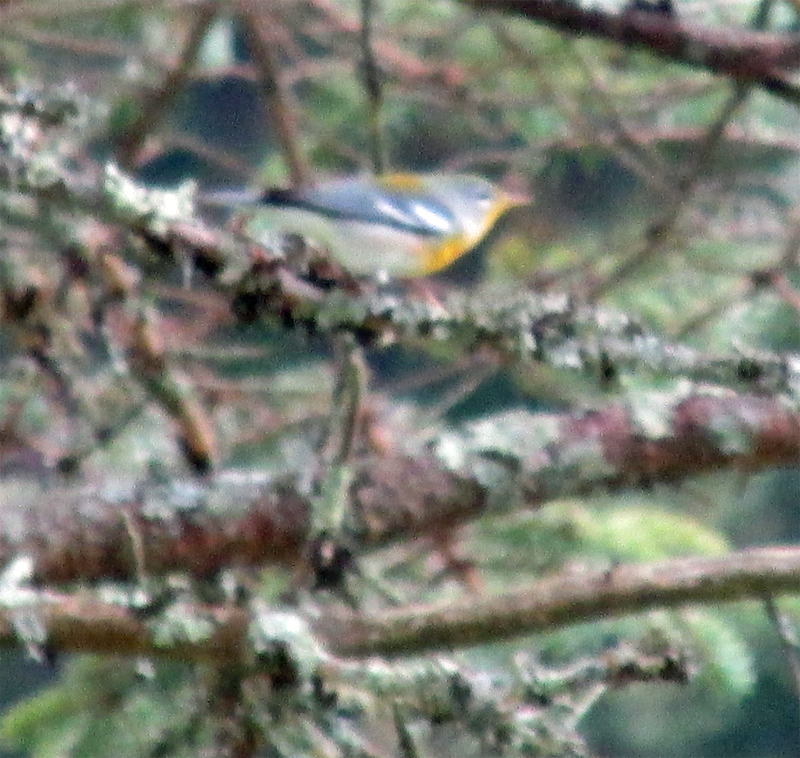 Male Hooded Warbler and Black-throated Blue Warbler showed up, as did a rather drab Cape May Warbler. A Scarlet Tanager showed up to compete with the Gray Catbirds, Rose-breasted Grosbeaks and Cedar Waxwings for wild cherries. I also had a close encounter with a young Ruby-throated Hummingbird, which hovered in front of me as it turned the tables and observed me for a moment. I wanted to try for a photo, but was sure if I moved I would scare it off. I did manage to get photos of the Hooded Warbler, a Rose-breasted Grosbeak and a pair of “kissing” American Goldfinch. Actually, it’s a photo of a female goldfinch feeding one of her insistently begging young. A nearby male goldfinch was besieged by six hungry youngsters. This evening of Sept 20 will likely prove the peak for warbler migration in the yard this fall. We’ll see if any of September’s remaining days can top it. New migrants for the fall season included a Bay-breasted Warbler, Summer Tanager and a Blue-headed Vireo. The other warblers for an evening of lawn chair birding with my mom included Tennessee, Magnolia, Northern Parula, Chestnut-sided, Cape May, Black-throated Blue, Black-throated Green, Yellow-throated, Black-and-White and American Redstart. So, 10 species in one evening is rather good! In addition, we watched Rose-breasted Grosbeaks, Gray Catbirds, Ruby-throated Hummingbirds, Cedar Waxwings and three Common Nighthawks soaring overhead. 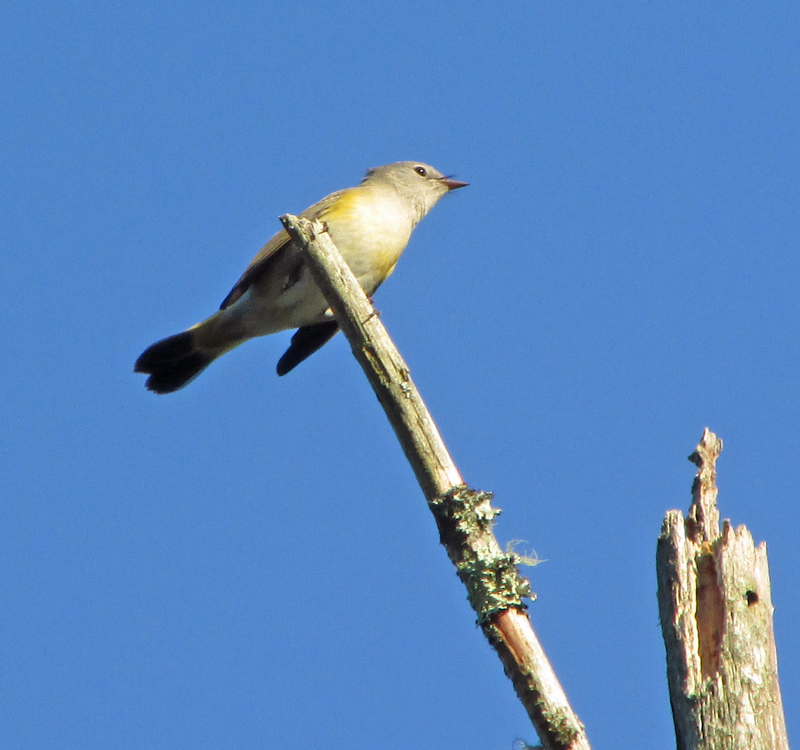 There was also an Eastern Wood-Pewee and, calling but not seen, a Red-eyed Vireo. All the feeder birds were present, too. We had Northern Cardinals, Eastern Towhees (including two recently fledged young), American Goldfinches, House Finches, Carolina Chickadees, Tufted Titmice, Carolina Wrens, White-breasted Nuthatches, Mourning Doves, Blue Jays, Downy Woodpecker and a Pileated Woodpecker calling on the ridge. A Black-and-white Warbler forages along a branch. Lawn chair birding was interrupted by rain on Sept. 21, but before then I did see some Rose-breasted Grosbeaks, a Brown Thrasher, Ruby-throated Hummingbirds, Gray Catbirds and a Tennessee Warbler. I have a feeling there would have been more to see if not for the rain. The chill in the air on Sept. 22 ensured that fall’s imminent arrival would bring some cooler temperatures. The birds were rather active during lawn chair birding, but the diversity had decreased. I did see Tennessee Warbler, Magnolia Warbler and American Redstart, as well as Cedar Waxwings, Rose-breasted Grosbeaks, Gray Catbirds, Ruby-throated Hummingbirds and assorted feeder visitors. 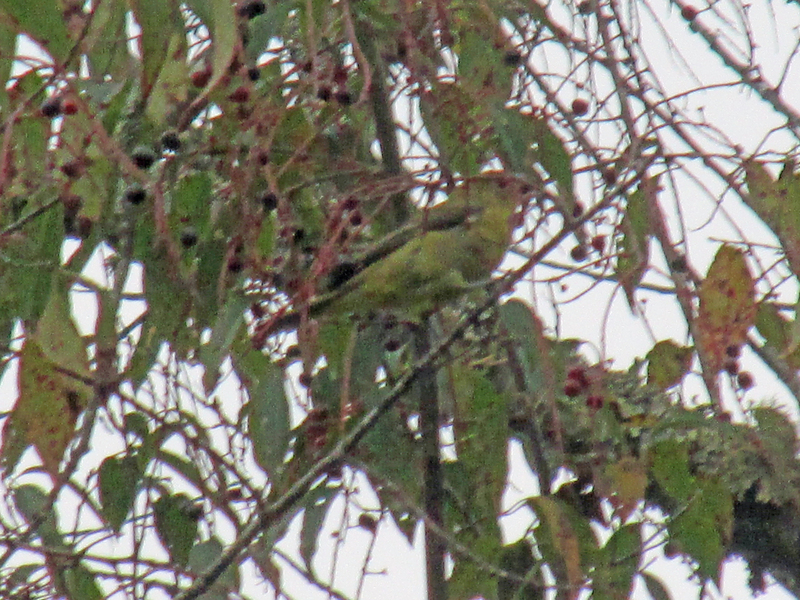 Lawn chair birding on Sept. 23 produced one new species — Palm Warbler — for the first day of fall. Other warblers included several Tennessee Warblers, well-marked Bay-breasted Warblers, American Redstart and Magnolia Warbler. I also saw Indigo Buntings, Rose-breasted Grosbeaks (including males still showing quite a bit of color), Cedar Waxwings, Gray Catbirds, Eastern Phoebe, Eastern Towhee and more. I also observed a male American Goldfinch taking some of his young to a sunflower head for a do-it-yourself snack. Young goldfinches must be very experimental in their tastes. This afternoon, I watched some clinging to branches over the pond so they could feed on pond slime/algae. Unless they were extracting bugs from the stuff, it seemed like an odd behavior to me. Photo by Bryan Stevens A migrating Blue-headed Vireo has captured a prey item for a quick snack. Bird activity was subdued on Sept. 26, but during lawn chair birding I did get a new fall arrival with the Palm Warbler in the gnarled remains of a peach tree. I also saw a Tennessee Warbler, Chestnut-sided Warbler, Cedar Waxwings, Downy Woodpecker, Eastern Phoebe, White-breasted Nuthatches, American Goldfinches, Eastern Towhee, Carolina Wrens, Carolina Chickadees and Tufted Titmice. On Sept. 27, I took part in the annual Fall Bird Count conducted by the Lee and Lois Herndon Chapter of Tennessee Ornithological Society. The day produced some warblers, especially along the linear walking trail adjacent to the Watauga River. 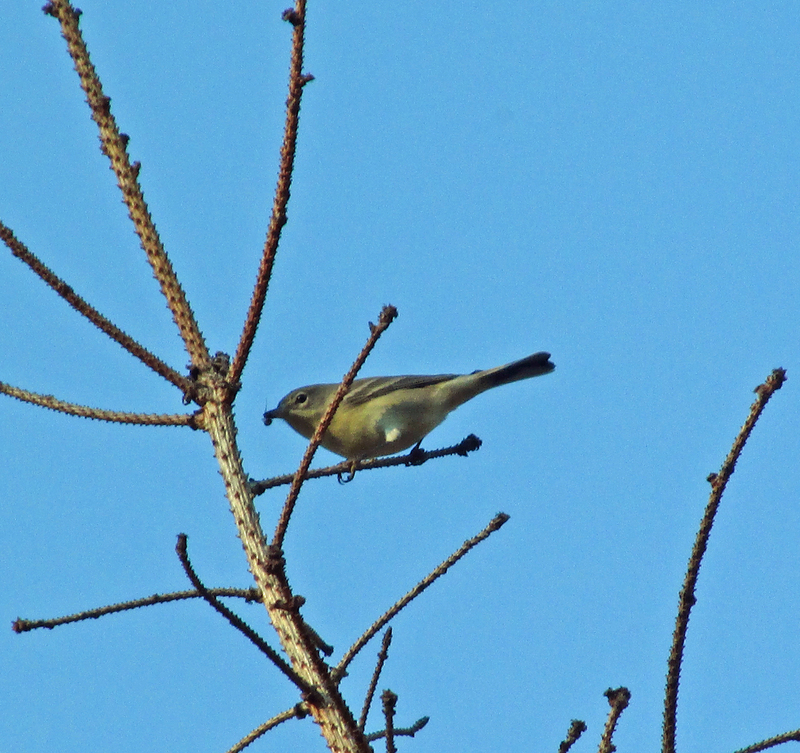 The species include Magnolia, Common Yellowthroat, Cape May and Northern Parula. You shoulI got home in time to add a few warbler species from my own yard, including Tennessee Warbler and Magnolia Warbler. Michael Briggs of Erwin asked me via Facebook when he should curtail feeding hummingbirds for the season. I informed Michael that I usually keep feeders up through at least late November, hoping to attract western “stray” hummers such as Rufous and Allen’s that come through in late fall and early winter. Depending on temperatures, I may keep at least one feeder available even later. Although Ruby-throated Hummingbirds usually depart in early October, keep your feeders available to benefit stragglers and to attract western species of hummingbirds that migrate through the region. This entry was posted in Birding, Birds, Fall migration and tagged Fall migrants, Fall migration, Our Fine Feathered Friends, warblers on September 28, 2014 by Bryan Stevens. Photo by Bryan Stevens Bob Sargent works diligently to band a Rufous Hummingbird at the home of Gary and Brenda Wallace in Elizabethton, Tenn. I was saddened to learn of the recent passing of Bob Sargent. 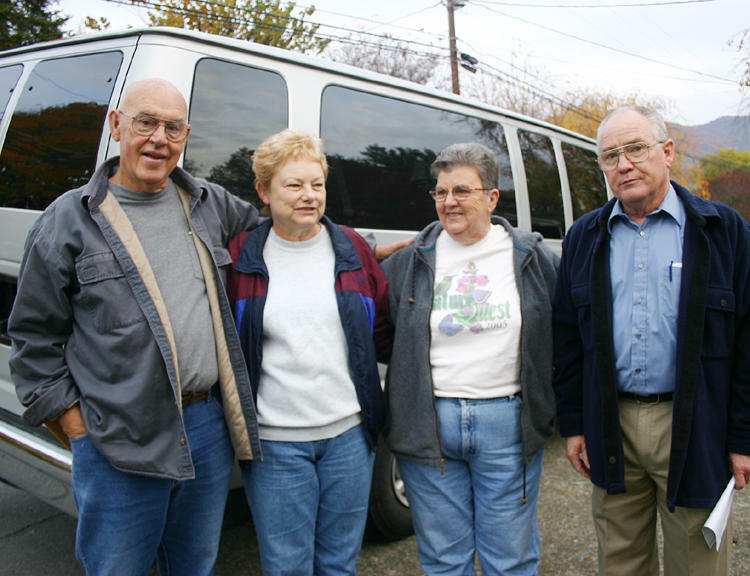 With his wife, Martha, Bob was the co-founder of the The Hummer/Bird Study Group. This non-profit organization founded by the Sargents was based in their hometown of Clay, Alabama, and dedicated to the study and preservation of hummingbirds and other neotropical migrants. Their research programs with hummingbirds and migrating songbirds got underway back in 1987. The HBSG was formed in 1994. The Sargents have described the HBSG as a child born of the necessity to support their continuing research. Photo by Bryan Stevens A Rufous Hummingbird gets a sip of sugar water midway through the banding process. It was also a way to reward those who contributed financially to that effort. In the early days the Sargents’ savings account paid the expenses incurred by the HBSG. Many friends and bird conservationists contributed financially to the cause, and the Sargents wanted these donations to be tax-deductible. The Sargent also became ambassadors in the promotion of hummingbirds. Their specialty became those species of western hummingbirds that have been gradually shifting their migration routes and wintering grounds to include forays into the eastern half of the United States. Photo by Bryan Stevens Martha Sargent takes a photo as her husband, Bob, lets Brenda Wallace hold a Rufous Hummingbird ready to be released after the banding process. In the late 1990s, the Sargents presented a well-attended program sponsored by the Bristol Bird Club. That was the first occasion I had to meet this energetic and dedicated couple. I wrote about the fascinating program in my bird column and shared with readers Bob’s emphasis on keeping sugar water feeders available during the winter months. It was an eye-opening program that tuned me into the phenomenon of wintering hummingbirds. Not too long after that column ran, I received a call from Bennette Rowan, an artist and Johnson City resident, in November of 1997. She had one of those western hummingbirds at her feeder. After she got in touch with me, the Sargents were also alerted. The couple arrived in Johnson City on Dec. 3, 1997, to band and identify the bird. To the surprise and delight of everyone present, the bird turned out to be an Allen’s hummingbird — the first of its kind ever found in Northeast Tennessee and only the fourth for the entire state. Bennette, who had orginally named her bird “Rusty,” modified the name to Rusty-Allen. The bird remained at her home until Dec. 16 of that year. 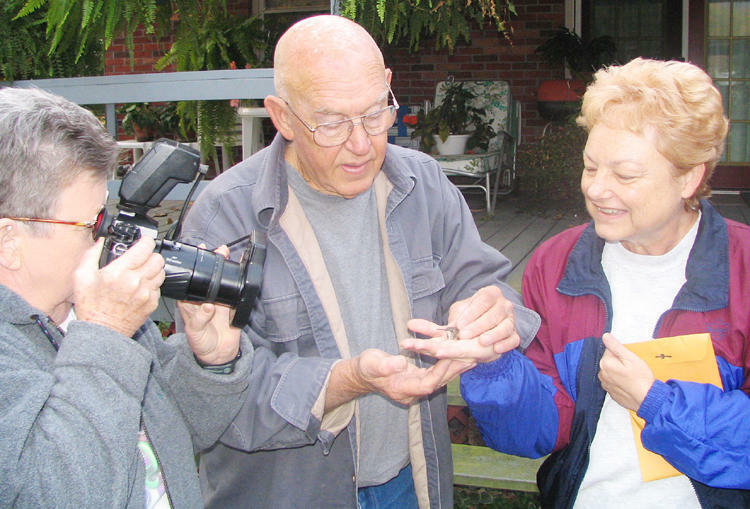 Photo by Bryan Stevens From left: Bob Sargent, Brenda Wallace, Martha Sargent and Gary Wallace pose for a photo after the Sargents successfully banded a Rufous Hummingbird at the Elizabethton home of the Wallaces. A few years later I got to watch the Sargents band another hummingbird at the home of Brenda and Gary Wallace in Elizabethton. On that occasion, I also photographed the couple as they went expertly about the precise job of capturing, documenting, identifying and banding the hummingbird. It turned out to be a female Rufous hummingbird. As more of these reports arrived every late fall and early winter, the Sargents became overwhelmed and could not respond to each and every case. 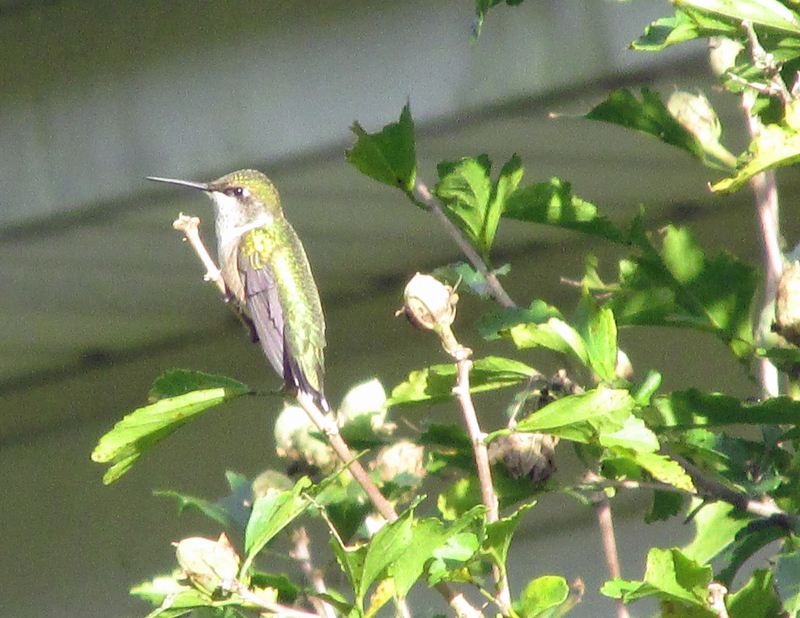 They began to bring other hummingbird banders under their wing, so to speak. 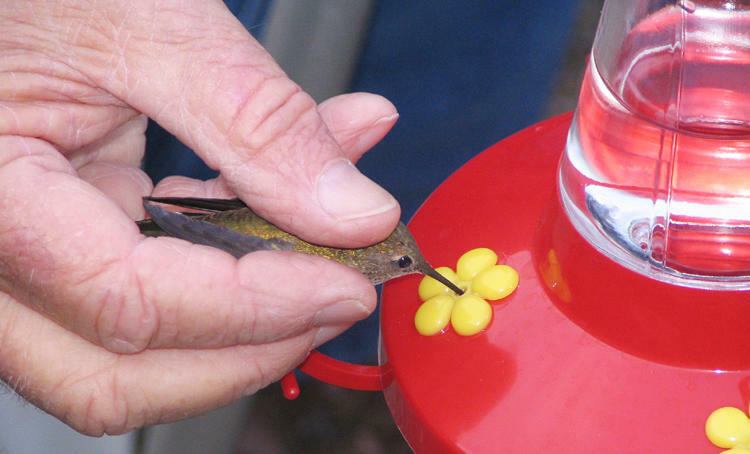 Individuals such as Chris Sloan and Mark Armstrong became principally involved with the documentation and banding of hummingbirds found within the Volunteer State. I feel extremely fortunate to have known Bob Sargent, who died Sept. 7, 2014, at the age of 77. 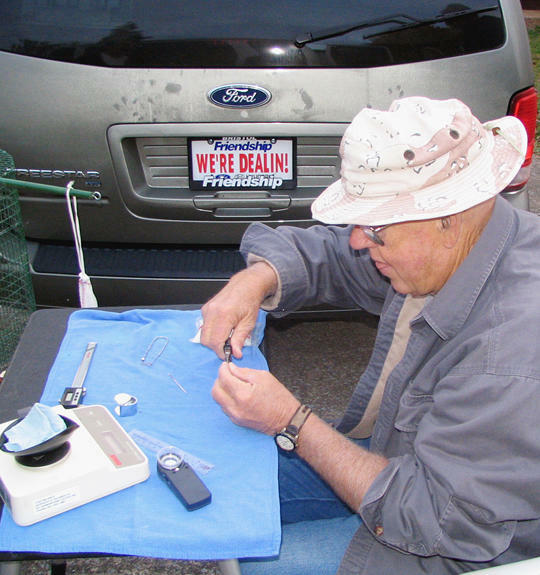 An electrician by trade, he leaves a lasting legacy of more than a quarter-century of research into the mysteries of some of our tiniest birds. 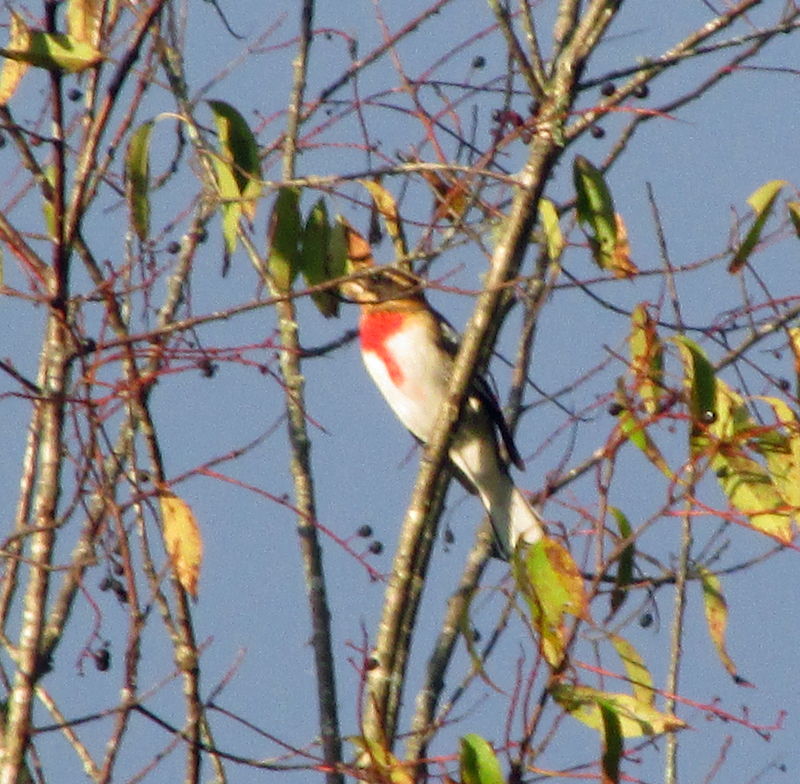 Several birders across Tennessee posted tributes to Bob on the TN-Birds list-serve forum. She also made a suggestion to those reading her post. “And perhaps at some point today, go outside, sit near your hummingbird feeders, listen for the hums and chirps of those tiny miracles and give thanks for Bob, for his life and for those birds,” she wrote in her post. Jud Johnston of Waynesboro, Tennessee, commented on Bob’s death. “A great loss for birders and birding in the Southeast,” Jud wrote. In the years since I saw that program, presented in such educational and entertaining fashion by Bob and Martha Sargent, hardly a year has gone by when a reader hasn’t alerted me to the presence of one of those “brown hummingbirds” that show up at their feeders when the Ruby-throated Hummingbirds have already flown south for the winter season. In the next couple of weeks, the Ruby-throated Hummingbirds that have made our spring, summer and fall so delightful will once again disappear. They’ll return in about six to seven months, but our lives will be a bleaker without them. This is where things can get interesting. Don’t take down your feeders. 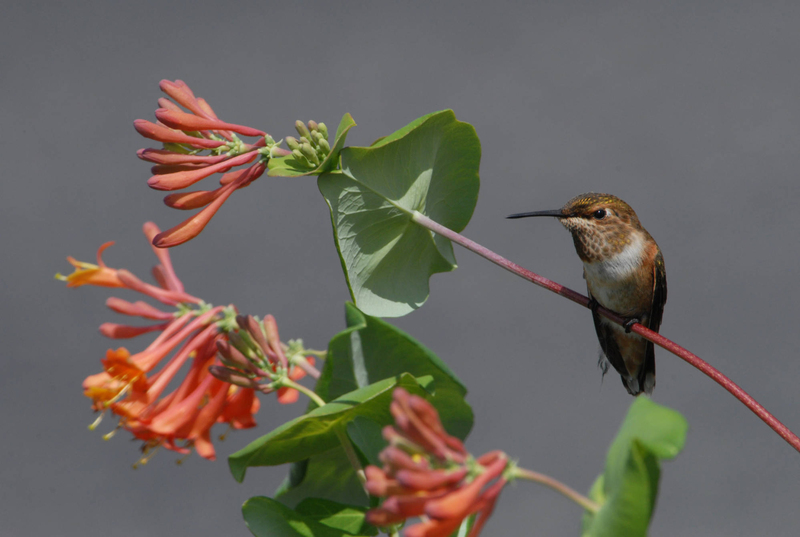 Keep a supply of sugar water available as “bait” to attract any Rufous Hummingbirds, or even Allen’s or Black-chinned Hummingbirds that might decide to spend late fall and early winter with you. So, be very attentive to any hummingbird that arrives at your feeders in late October or early November. Most Ruby-throated Hummingbirds depart the region in early October. Many of these winter-visiting hummingbirds show a great amount of brown plumage instead of the usual green. Any of these conditions may indicate you’ve been gifted with a rare visit from one of these exceptional little birds. If you are so fortunate, please send me an email at ahoodedwarbler@aol.com. The Rufous Hummingbird is increasingly becoming a migrant/winter resident in the eastern United States. This entry was posted in Birding, Birds, Bob Sargent, Hummer/Bird Study Group, Hummingbirds and tagged Birding, Bob Sargent, Bryan Stevens, Carter County Compass, Elizabethton Star, Erwin Record, Hummingbirds on September 21, 2014 by Bryan Stevens. With every passing day, autumn is creeping closer. The calendar indicates that the first official day of fall is Sept. 23, but the rest of the world around us doesn’t wait for us to turn the page. 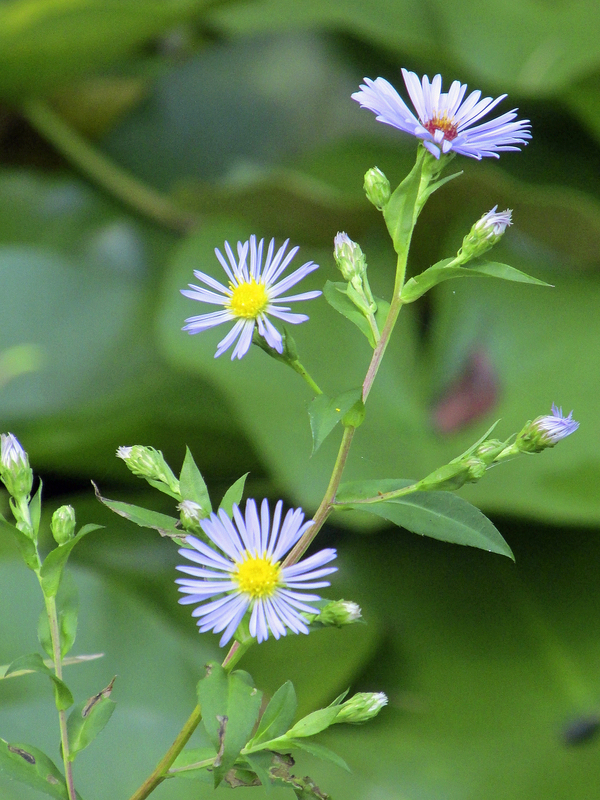 Asters, which come in a variety of colors, are usually a late-blooming wildflower. Fall is upon us, which is apparent in a myriad of subtle signs, from the blooms of new wildflowers to the last surge of the season’s butterflies and dragonflies. Of course, there’s also the migration of our feathered friends. The dazzling birds of spring, such as Scarlet Tanagers and Rose-breasted Grosbeaks, are winging their way through our backyards again. 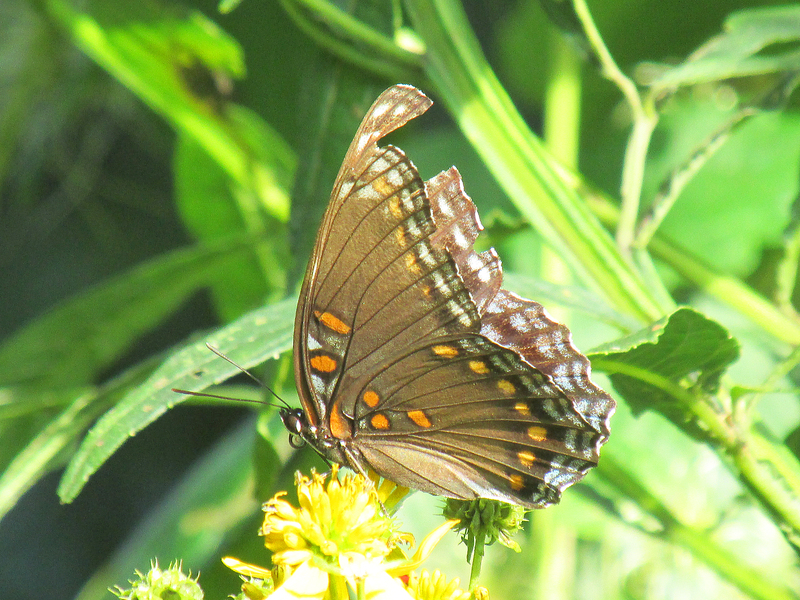 Many butterflies, such as this swallowtail, look rather tattered this far into the season. Many of these visitors have adopted a more subdued appearance as they stage their earlier migration flights in reverse. Then, there are fall warblers, sometimes also known by birders as “confusing fall warblers” since not only do observers have to distinguish between differences in male and female plumages, but also must contend with immature birds that resemble neither of their parents. 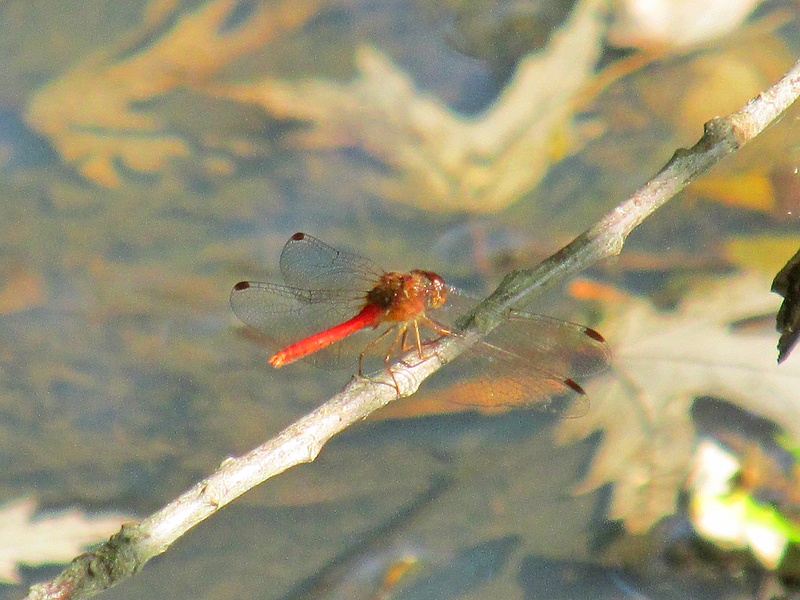 Along the edges of ponds, the final dragonflies of the season have begun to emerge. Autumn Meadowhawks and Blue-faced Meadowhawks have both made appearance at my fish pond along Simerly Creek Road. Other dragonflies have been scarce, and the damselflies have almost disappeared. I am still seeing a few Eastern Pondhawks, Blue Dashers, Eastern Amberwings and even a Fawn Darner. The aptly-named Autumn Meadowhawk is one of the last dragonflies to emerge each year. During a visit to Erwin Fishery Park on Sept. 12, I was amazed to observe thousands of dragonflies — basically, a swarm of these incredible winged insects — hawking for smaller winged insects in the air above the now-closed swimming pool at the municipal park. Most of the individuals in this incredible swarm looked like Green Darners, but I think a few other species had also joined the feeding frenzy. Green Darners, incidentally, are known for gathering in large flocks, just like birds, and staging their own migratory flights. Katydids, some resembling nothing so much as a green leaf, are becoming more prominent as summer transitions into fall. 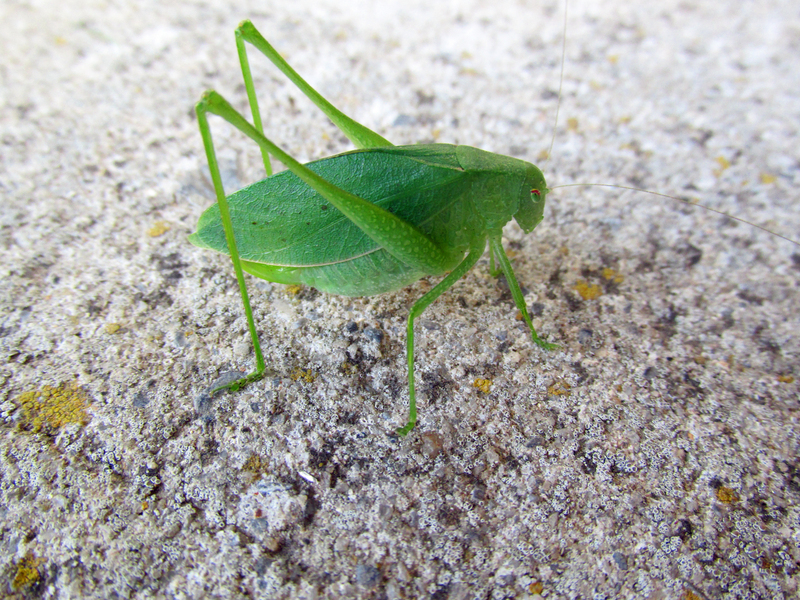 Speaking of insects, I’ve also been hearing Katydids. A recent post of a Katydid photo on my Facebook page prompted responses that brought up the old superstition that the first frost will take place several weeks after the Katydids begin their nocturnal serenades. I always look forward to September, but it always seems to be an extremely busy month for me. This year’s no exception, but I am determined to carve out some time to enjoy this month of transition. Join me in paying closer attention to the world around you this month. There are new birds to see almost every day if you simply take the time to look. If the birds are absent, look with even more attention to detail and you’re sure to be rewarded with some other remarkable observations. A male Hooded Warbler makes a quick journey through the back yard. Photo by Bryan Stevens A newly-hatched Snapping Turtle will have a few weeks to grow before burrowing down to hibernate through the long, cold winter season. This entry was posted in Birding, Birds, Butterflies, Damselflies, Dragonflies and tagged Autumn, Birding, birds, Birdwatching, Confusing fall warblers, Fall, migrating birds, Nature viewing on September 14, 2014 by Bryan Stevens. Among my birding friends, it’s no secret the warblers are among my favorite birds. I impatiently await the start of fall migration each year knowing that it holds the potential of bringing about two dozen warbler species to my yard. The trickle of fall migrants has already started with the arrival of juvenile Chestnut-sided Warblers and American Redstarts to my yard on Aug. 19. 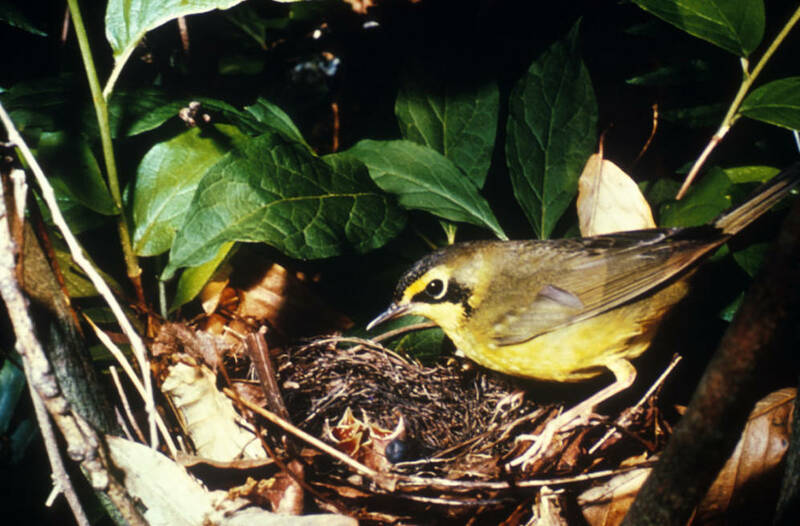 A Kentucky Warbler brings food to young in a nest. The wood-warblers, the more clinical name for this group of birds, consist of 116 species exclusive to the New World. About half of the species collectively make their home in North America for at least a few months out of the year. The others range throughout the Caribbean, as well as Central and South America. Most of them are noted for leading frantic, fast-paced lives that are far from sedentary. For this reason, they can be extremely challenging to observe with a pair of binoculars. Photo by U.S. Fish and Wildlife Service A female Hooded Warbler sits tight on her nest. 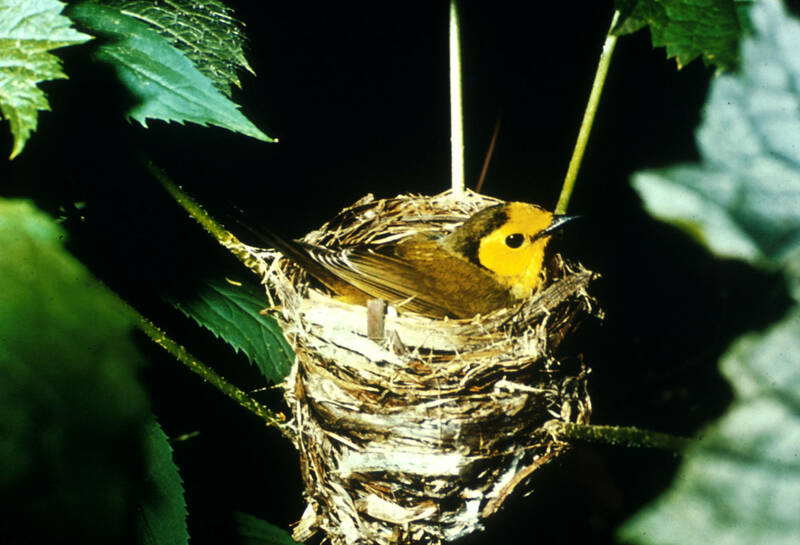 The Chestnut-sided Warbler and American Redstart nest at various locations in Southwest Virginia and Northeastern Tennessee, but they are not usually present during the summer months. I do host a few species of warblers that nest in the woodlands around my home. 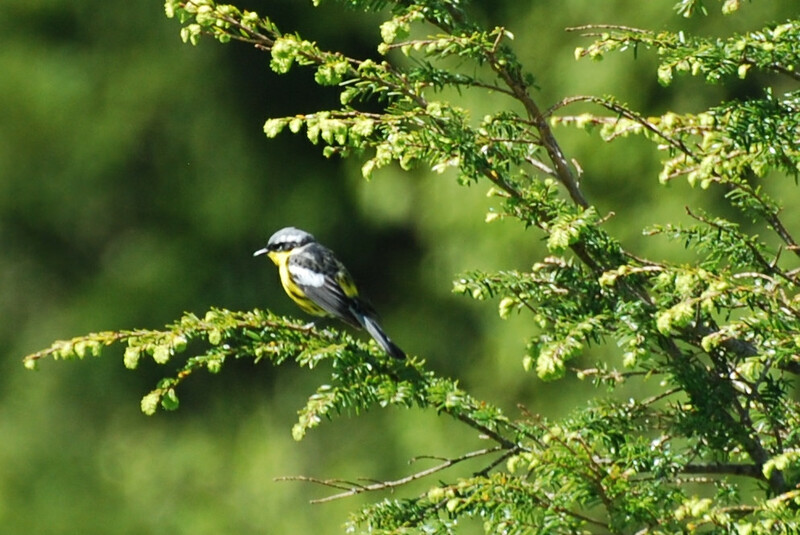 These include Hooded Warbler, Northern Parula, Black-throated Green Warbler, Black-and-white Warbler and Ovenbird. Photo by U.S. Fish and Wildlife Service Although usually silent in the fall, Ovebirds have a distinctive, ringing song they sing constantly in the spring. One of the last warblers to arrive at my home this spring was the enigmatic Ovenbird. With its loud, ringing song — “Teacher! Teacher! Teacher!” — it’s impossible not to notice the arrival of this warbler. So, even after the other summer warblers had already been present for a couple of weeks, I finally heard the song of an Ovenbird ringing from the woods. Why do I describe this warbler as enigmatic? For starters, Ovenbirds do not easily permit even stealthy birders to glimpse them. I have gotten good looks at Ovenbirds throughout the years, but they are still difficult to observe. They are one of the warblers more easily heard than seen. When they are observed, it’s usually no more than a fleeting look before the bird dives back into heavy cover. The Ovenbird is not one of the brightly colored warblers, such as Blackburnian Warbler or Yellow Warbler. The Ovenbird is a small brown bird with a white breast with dark streaking — an appearance that bears a superficial resemblance to the larger thrushes that share the same woodland habitat. The only hint of color is an orange crown bordered by dark stripes atop the bird’s head. Even this orange crown patch is not easily seen. When agitated, an Ovenbird may raise its head feathers, which makes this orange mark easier to detect. The Ovenbird also has a distinct white ring around its eyes. They also have pink legs and a pinkish bill. 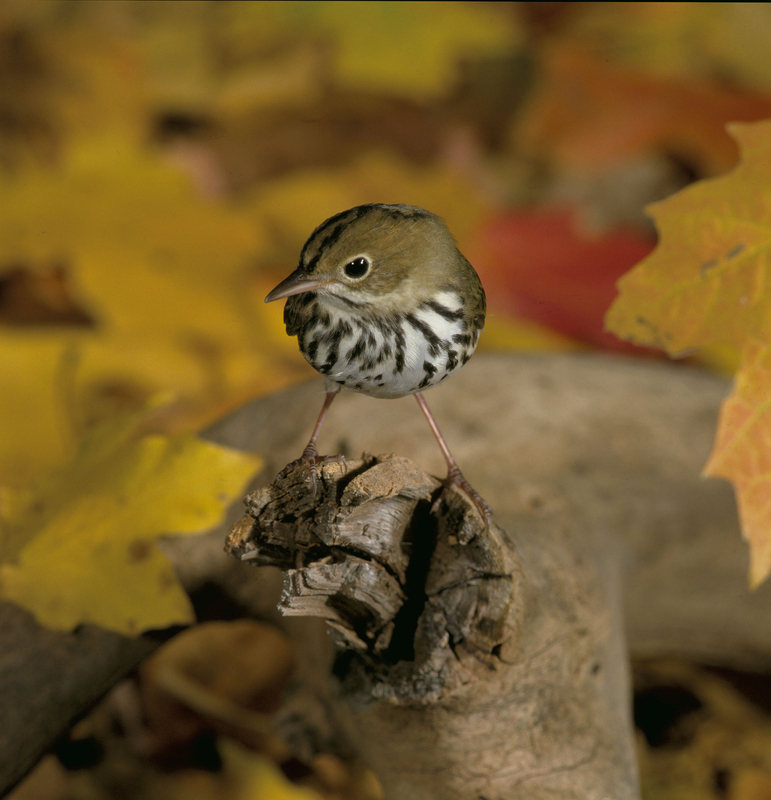 Ovenbirds spend the summer nesting season in mature deciduous and mixed forests across Canada and the eastern United States. Ovenbirds migrate each fall to the southeastern United States, the West Indies, and from Mexico to northern South America for the winter season. Photo Courtesy of Jean Potter A Magnolia Warbler perched on an evergreen bough. The last day of August provided fantastic lawn chair birding here at home. I saw a Scarlet Tanager, Red-eyed Vireo, Eastern Phoebe, Eastern Wood-Pewee, an Epidomax “empid” flycatcher species and a flock of at least 50 Common Nighthawks. I also added three fall warblers to my list: Yellow-throated Warbler, Chestnut-sided Warbler, Northern Parula and Magnolia Warbler. I also saw plenty of Ruby-throated Hummingbirds, Gray Catbirds, a Brown Thrasher, Cedar Waxwings, Downy Woodpecker and many of the regular feeder visitors. The arrival of September brought even more warblers to my yard as they make brief visits during their fall migration. I had better luck with lawn chair birding while saying goodbye to August than I did welcoming September. On this first day of September that was also Labor Day, I saw a single Common Nighthawk, as opposed to last night’s flock of 50. 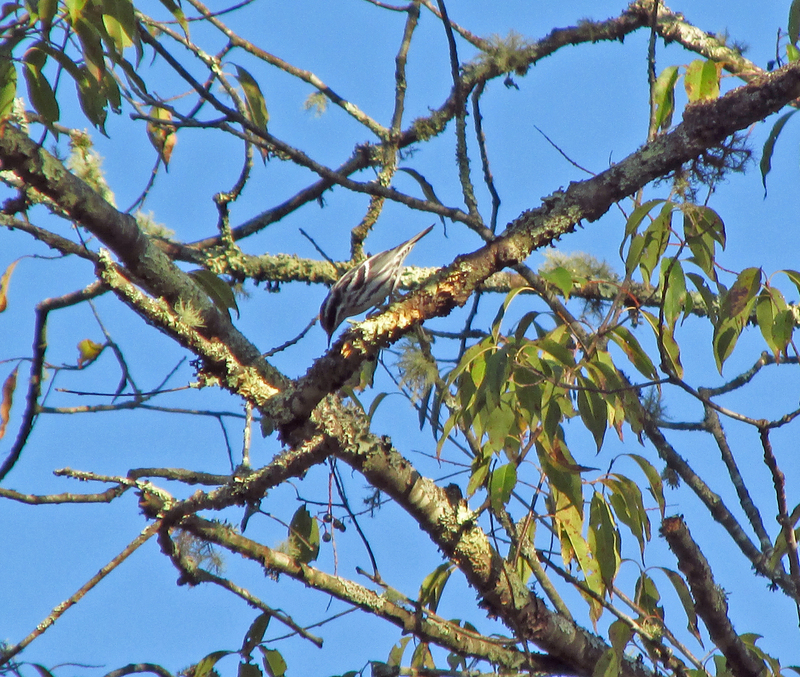 I only saw one warbler, but it was a Chestnut-sided Warbler and different than the species I saw last night. Other birds that I observed including several Gray Catbirds and Blue-gray Gnatcatchers, Eastern Wood-Pewee, Brown Thrasher and family flocks of American Goldfinches and House Finches. Earlier that same day, I watched and listened as a Common Raven flew overhead. The Ruby-throated Hummingbirds are also still numerous. Photo by Bryan Stevens A migrating Northern Parula forages for insects in the branches of a Blue Spruce. My lawn chair birding on Sept. 3 was brief but interesting. One new warbler, a male Canada Warbler, showed up, as well as two Northern Parulas that spent all their time chasing each other through the holly and the willow trees. I also got a fleeting glimpse of a Magnolia Warbler. In the sky overhead, a single Chimney Swift glided through the air with a trio of Common Nighthawks. The cast of migrants changes almost daily. I enjoyed a good evening of lawn chair birding on Sept. 5, adding a few new warblers for the fall to my list. Only saw four species, but two of them — immature Black-and-White Warbler and Black-throated Green Warbler — were new for the fall. 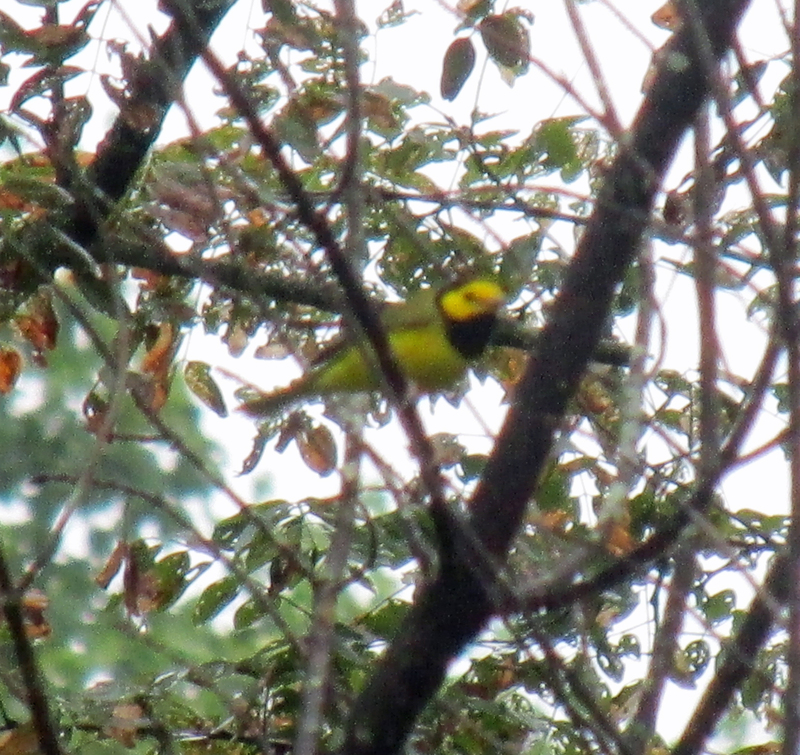 I also saw Chestnut-sided Warbler and Northern Parula. A sizable flock of at least 50 Common Nighthawks passed overhead. Other sightings included Eastern Phoebe, Brown Thrasher, Gray Catbirds, Wood Thrush, Pileated Woodpecker, Red-eyed Vireo and Ruby-throated Hummingbirds. All the resident feeder birds have enjoyed a good nesting seasons with numbers of Song Sparrows in the yard are showing an increase. Photo by U.S. 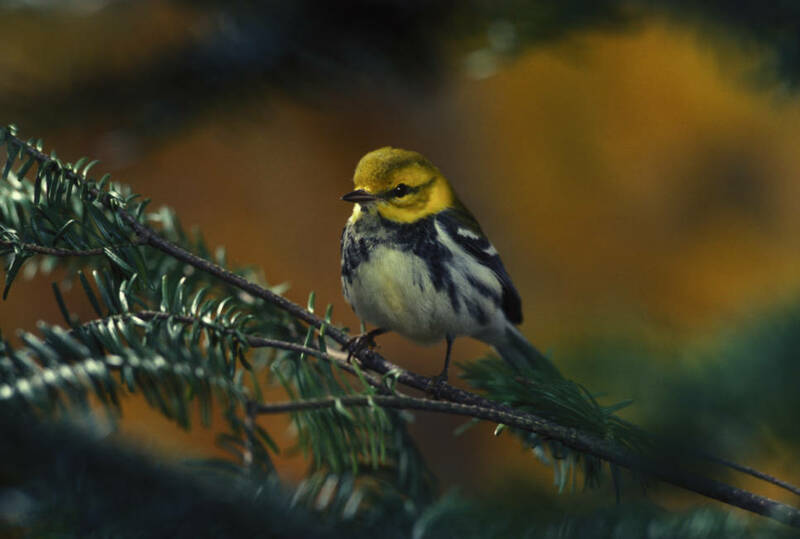 Fish and Wildlife Service A female Black-throated Green Warbler perches in a conifer. I was surprised On Sept. 6 with an observation of a Cape May Warbler (a young male) feeding low in vegetation in the swampy area of the backyard. It might seem odd to find a Cape May feeding so low to the ground, but it was at the base of a large Norway Spruce. This was a new warbler for the fall migration season. 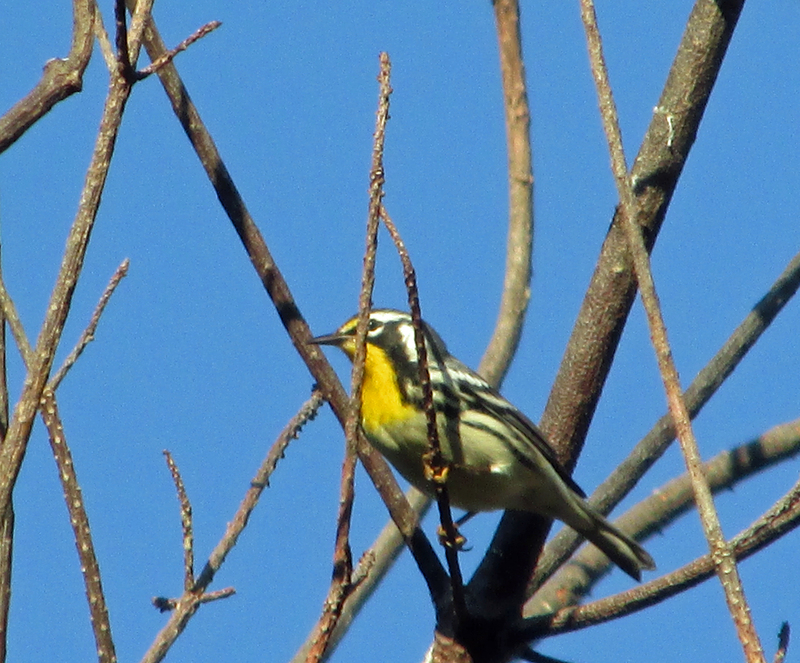 That same day, I observed two Magnolia Warblers and a Northern Parula. In the evening, small flocks of Chimney Swifts and Common Nighthawks flew over my home. So, the first week in September has seen fall migration off to a good start. I love to hear what others are seeing as the fall season advances. Email me at ahoodedwarbler@aol.com or comment here at my blog. 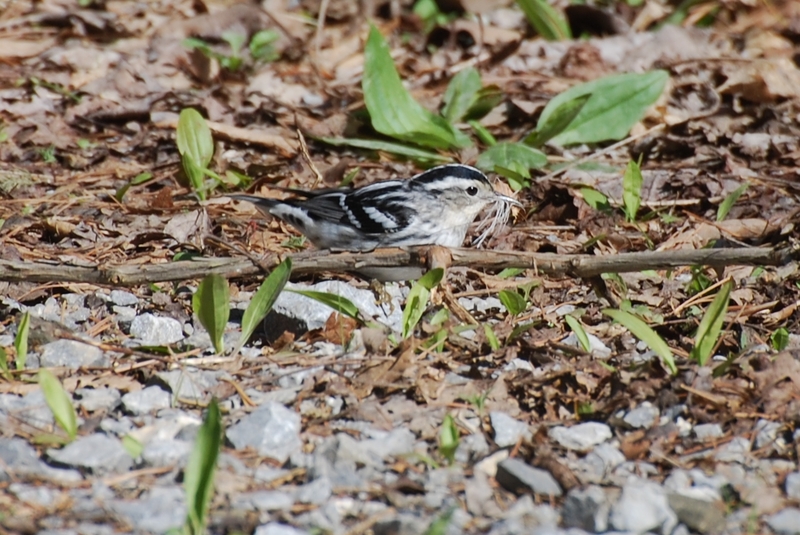 Photo Courtesy of Jean Potter A female Black-and-white Warbler gathers nesting material. This entry was posted in Birding, Birds, Warblers and tagged Bird, Birding, Carter County Compass, Elizabethton Star, Erwin Record, Fall migrants, Fall migration, warblers on September 7, 2014 by Bryan Stevens.